Versa is launching a new network for sponsored op-eds, which it calls Featured Perspectives. The startup is also announcing that it has raised additional funding led by The Omidyar Network (the firm created by eBay founder Pierre Omidyar), bringing its total seed round to $2 million. Other investors include the John S. and James L. Knight Foundation, as well as Quotidian Ventures. Hence the creation of the Versa Media Network, which connects online publishers with organizations willing to pay to have their opinions and content featured in related articles. You can see some examples from Versa’s initial publishers — in this article in The Philadelphia Inquirer, a news account of Pennsylvania Gov. Corbett’s statements on gay marriage is followed by a comment from Human Rights Campaign criticizing Corbett. 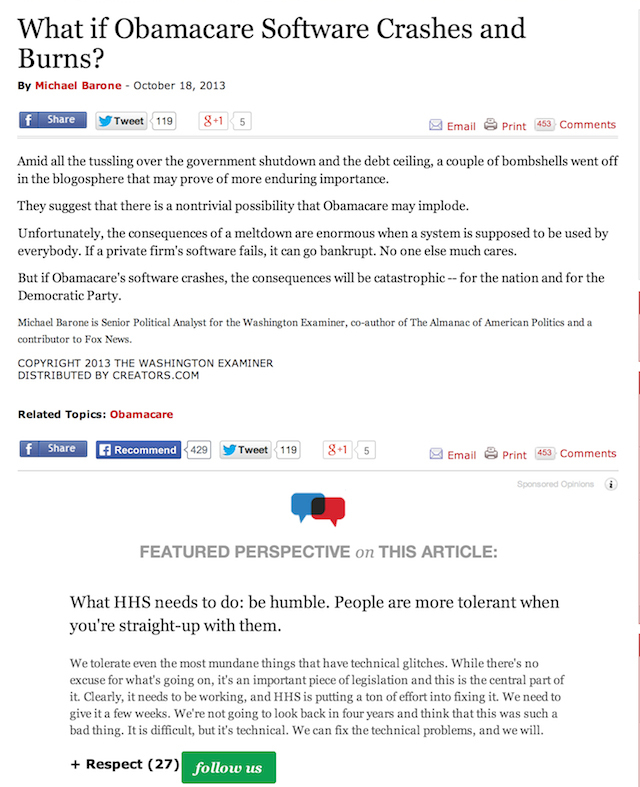 And this column in RealClearPolitics looking at the problems with the Obamacare website is accompanied by a comment from benefits company Maxwell Health offering its own thoughts on the issue. Dannenbaum said Versa has built technology that analyzes news articles as they’re published and flags the ones that may be relevant to organizations that have signed up as a potential contributors. Then, once a contributor gets an alert and decides to write something, she said it becomes “a human process” of writing a comment and submitting it for publication. Timeliness is definitely an issue, she acknowledged — if someone submits an additional perspective days after an article has gone up, it’s probably not going to be seen by that many readers. However, Dannenbaum said the average response time is under an hour. She argued that this approach benefits readers, too. Traditionally, news stories and op-eds have been “sectioned off” from each other, but online, it makes more sense to present these things “side by side.” In addition, she suggested that many organizations are trying to accomplish similar ends already, by posting anonymous comments that back up their views. So having a sponsored comment or op-ed unit makes things more transparent. As for the quality of these Featured Perspectives, Dannenbaum said that whatever content guidelines a publisher has, they’ll also apply to Versa’s content. Plus, publishers will always have the right to remove a Featured Perspective from their site, no questions asked.